Location: This will be a one-hour, virtual meeting conducted using Zoom. After registration, we will send you details about how to meet online. Registration Deadline: Please register by Monday, March 26, 2018. There are no fees associated with this event. 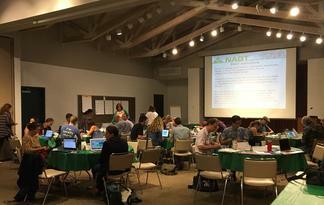 We are very excited that many of you were able to join us in August 2017 at Huntington Library and Gardens for some or all of our "Geoscience Retreat for Southern California 2YC Geology, Geography, and Environmental Science Faculty" (see photos on this page). We plan to continue facilitating connections between 2YC geoscience faculty at different campuses in the southern CA region, and hope that you will find these collaborations fruitful and fun. We hope that those of you who were unable to attend the August retreat can join us for this one-hour virtual meeting, and perhaps join us for future face-to- face meetings. This virtual meeting will provide an opportunity to continue conversations about student success at 2YCs in southern California. We hope that everyone who participated in the August 2017 retreat can share something new that they have tried in their own classroom. There will be a chance to discuss any challenges that you are facing in implementing your action plans that you developed at the August workshop. Please complete the online registration form by March 26, 2018. It includes specific questions about what you have tried, or plan to try, in your classrooms. It also gives you a chance to suggest topics for future workshops. There is no cost to participate in this follow-up activity, but registration is required. After registration, we will send you details about how to meet online. In preparation for the meeting, please plan to introduce yourself to the group by providing your name, institution, and courses that you teach, followed by a description of at least one new activity that you've tried, how you think it worked with your students, and whether or not you would use it again in your teaching. Some of the new activities that we discussed in the August 2017 workshop include (not an exhaustive list!) exam wrappers, think-pair-share, gallery walks, minute papers, brainstorming, and clickers. 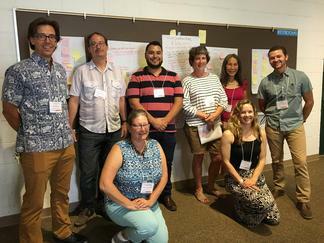 Brief overview of August 2017 workshop highlights and outcomes.